John Alsop thinks that this is the Royal Train again, but where? The near carriage is no.57. 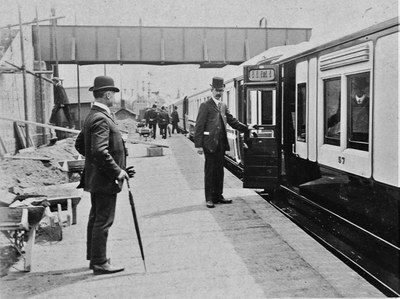 The bowlers on the platform are J.Lee (left) and Hill holding the open door. The card came with a collection of Peterborough cards relating to the construction and opening of the Crescent bridge over the Great Northern main line at the south end of the GN station, so could perhaps relate to that event. The date of this was 16/4/1913. I don't know the location, but it does not seem to be GNR. The signals are ordinary lower quadrant semaphores, not somersaults. Looking at the hut on the left I would rather guess GCR. Saloon no. 57 was not assigned as a Royal Train vehicle. The next vehicle appears to be one of the 57ft 0in semi-Royal saloons of D.1, so a VIP train but not a Royal train. I cannot answer the questions at all, but would like to comment on the paint finish. Not only is there a superb shine on the lower panels, but also on the footboards which were, by design, intended to be trodden on by muddy boots and so on. I realise it is a special vehicle, but from experience those footboards remain shiny in service for just a few hours! I believe the answer to this mystery will be found in our own archives. Document MISC010 lists Royal train journeys between 1896 and 1926 and who travelled on each journey. If anyone has access to this document, we should have the answer. Certain King George V and Queen Mary used the Royal train five days later to make a visit to Crewe, but I have been unable to find any reference to them attending the opening of the Crescent Bridge in Peterborough. I can't comment on time or place but it seems very unlikely that the platform & surroundings would be in such a state (building materials, wheelbarrows and so on) for a royal visit. Surely there would have been some form of screening, tidying or 'window dressing' done, which seems to support Mr. Millard's conclusion of VIP but not Royal train service.